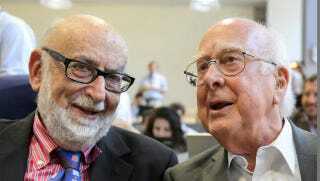 The 2013 Nobel Prize in Physics has been awarded to Francois Englert and Peter Higgs, for their work on the theory of the Higgs boson a.k.a. "The God Particle" a.k.a the elementary particle thought to explain why some other particles have mass a.k.a. the fundamental particle whose discovery Stephen Hawking bet against – a bet he lost last year, when physicists at the ATLAS and CMS experiments at CERN's Large Hadron Collider confirmed the Higgs boson's existence. Stop calling it "The God Particle!" What&apos;s the Matter with the Higgs Boson? Stephen Hawking on the Higgs discovery: "It seems I have just lost 100 dollars." The awarded theory is a central part of the Standard Model of particle physics that describes how the world is constructed. According to the Standard Model, everything, from flowers and people to stars and planets, consists of just a few building blocks: matter particles. These particles are governed by forces mediated by force particles that make sure everything works as it should. The entire Standard Model also rests on the existence of a special kind of particle: the Higgs particle. This particle originates from an invisible field that fills up all space. Even when the universe seems empty this field is there. Without it, we would not exist, because it is from contact with the field that particles acquire mass. The theory proposed by Englert and Higgs describes this process. On 4 July 2012, at the CERN laboratory for particle physics, the theory was confirmed by the discovery of a Higgs particle. CERN’s particle collider, LHC (Large Hadron Collider), is probably the largest and the most complex machine ever constructed by humans. Two research groups of some 3,000 scientists each, ATLAS and CMS, managed to extract the Higgs particle from billions of particle collisions in the LHC. Even though it is a great achievement to have found the Higgs particle — the missing piece in the Standard Model puzzle — the Standard Model is not the final piece in the cosmic puzzle. One of the reasons for this is that the Standard Model treats certain particles, neutrinos, as being virtually massless, whereas recent studies show that they actually do have mass. Another reason is that the model only describes visible matter, which only accounts for one fifth of all matter in the cosmos. To find the mysterious dark matter is one of the objectives as scientists continue the chase of unknown particles at CERN.